Now we come to the Brandy Fizz, which is a recipe you can find much more easily than the previous Brandy Cocktail. 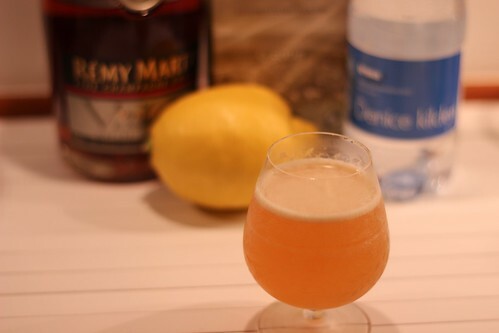 The modern drink is still the same as this classic, and the recipe is older than the 1930s, showing up back in the late 1800’s (though with a lot less lemon juice in it). All fizzes get their name from the addition of soda water. Fizzes as a drink class also all have citrus of some sort in them. This is essentially a fizzy brandy lemonade. Yum. Axel has his explanation of “sour mix” at the back of his notebook, and this is just 1/2 lemon juice, 1/2 sugar. This recipe called for 1/1 of cognac and 1/2 sour mix. This is where these old recipes get confusing. Given that the cognac is 1/1, 1/2 of what? So, I went with 1 oz sour mix to the 2 oz cognac. Savoy and Café Royal both called for just using a 1/2 lemon, with Savoy stating it is the juice, and the Café Royal saying to drop the whole half in the mixing tin and muddle it. Shake with ice and strain into a small lemonade glass or medium glass, top with soda water. You’ll notice that in the two recipes, one calls specifically for powdered sugar, while Lommebogen’s does not. I dug around a bit to see if I could figure out what Axel meant by “sukker.” Thankfully, in his short list in the back of the notebook with ingredients (like the sour mix), he states that “sukker = G G sukker” which stands for groft granuleret sukker, translated to coarse granulated sugar, for which we would use regular granulated sugar today. He also has his recipe for syrup (sirup), which is just a regular simple syrup of half water, half sugar. Just from looking at the Lommebogen recipe I was expecting it to be too sweet. The sour mix has sugar in it, and less lemon than the other recipe, plus it adds yet more sugar. It was sweeter. Not horribly so though, because of the soda water. Still drinkable, I just prefer more sour in my drinks. I also did have just a little bit of undissolved sugar in the bottom of my glass. It wasn’t a lot, but I’d definitely just use powdered sugar. For the other variation I used 1/2 a lemon and muddled it with 1.5 teaspoons of powdered sugar. That made me pucker. So I tried again with 1 oz lemon juice (1/2 a lemon) and 1 full tablespoon of powdered sugar. That was really nice. Perfect for me. This drink is really just about getting the sweet and sour balance to your liking, and so is very easy to play with and perfect for your personal tastes. It’s a really refreshing drink, and I can see this on my summer bar list.